The Red-Faced Wobbler was created a couple of seasons ago to take smallmouth bass in Northeastern Iowa streams. Since then it has proven itself on other warmwater species, especially crappies. 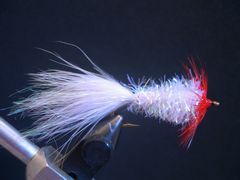 An article about the Red-Faced Wobbler was published in the Spring 2008 issue of Fly Tyer magazine. If you're not familiar with Fly Tyer magazine, you should be, and you should subscribe to it. It's the best there is. To learn more about Fly Tyer magazine or to subscribe on line, click on the following link. 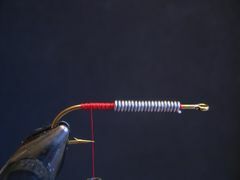 The Red-Faced Wobbler in the tying steps is tied on a size 6 hook. 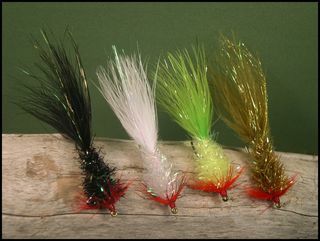 Depending on the species, I tie the Wobbler from a size 2 or 4 for stripers and other big fish to a size 8 for bluegills and trout. 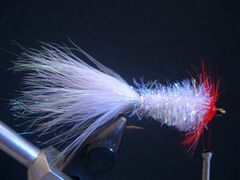 I also tie the Wobbler in a variety of colors including purple and orange. My favorite colors are pearl, black, and chartreuse. I use .030 or .035 lead wire on the size 2, 4, and 6 hooks and .020 wire on the size 8 hook. I also add several strands of Lite Brite to the tail for added flash. You could also use pearl Flashabou.. 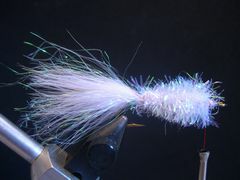 The Wobbler is very easy to tie. The criticial step is trimming the Estaz body so that the body tapers from the face to the tail. This is best accomplished with a pair of curved and serrated scissors. 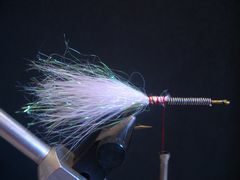 Be sure to attach the Wobbler to your leader with a Duncan Knot, sometimes referred to as a Uni-Knot. This open loop knot allows the fly to wobble more freely. Fish the Wobbler as you would any other streamer. Even though I generally fish the Wobbler on a weight-forward floating line with a nine-foot 3X leader, there are times when I prefer to use a five-foot sink tip, especially in rivers and streams. Wrap a substantial thread base on the hook shank. Make about 18 wraps of lead wire to the front of the thread base; be sure you leave enough room in front of the wire for the face and the thread head. Tie on the marabou tail behind the lead wire; the tail should be slightly longer than the hook. Next, tie several strands of pearl Lite Brite on the near and far sides of the tail; you may substitute pearl Flashabou but it's not so subtile as Lite Brite. Cut a 10-inch long piece of Estaz. Wrap thread to the front of the lead wire and tie the Estaz to the top of the hook. Bind the Estaz along the top of the lead to the base of the tail to create a smooth underbody. 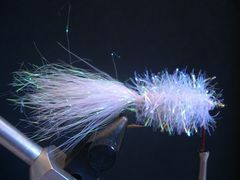 Wrap the Estaz forward to form the body of the fly; stroke the fibers back as you work. Tie off and clip the excess Estaz. Use scissors to taper the sides, top, and bottom of the body. Curved serrated scissors work best for this task. Strip the fluffy fibers from the base of the hen neck feather. 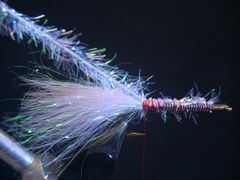 Tie the feather tip to the hook with the cupped side of the feather facing the fly. Make two or three wraps of hackle in front of the body. Tie off and clip any remaining feather. Wrap a neat thread head and tie off the thread with a whip-finish or a couple of half-hitches. Clip the thread and coat the head with cement.